West Windsor, N.J. – Since her teens, Savannah Dziepak ’17 (A.S., Biology) has been way ahead of the curve. Learning her high school curriculum at home, she passed the High School Equivalency exam at the age of 16 in December 2012 and then enrolled at Mercer County Community College (MCCC), taking the general education requirements for her associate degree online before arriving on campus in the fall of 2014. Now, at the ripe old age of 22, Dziepak, a Biology/Chemistry major at William Paterson University (WPU), has totaled more hours in a science lab than the vast majority of college juniors. 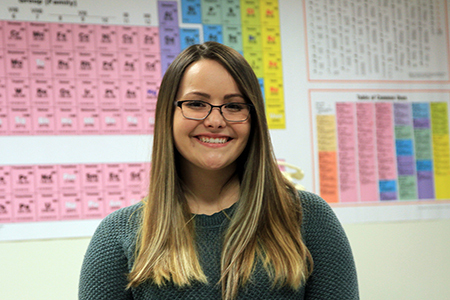 She credits MCCC with helping her discover her passion for science. First intent on studying art and photography, she took classes in anatomy and biology and was hooked. Dziepak says MCCC was a logical first step in her college education. “I was still young for college. When I started, I was the youngest in all my classes. But classes were small and I came to realize that my professors were not scary. They were good teachers, they were helpful, and they wanted you to contribute and to ask questions," she said. She also found numerous mentors at Mercer, including Professor of Biology Laura Blinderman, who recommended her as a peer tutor for MCCC’s Science Learning Center. Throughout the 2016-17 academic year, Dziepak spent 14 hours a week assisting fellow students learn science concepts in simple terms while she bolstered her own knowledge, her science vocabulary and her confidence. “Being a tutor reinforced my learning. I also learned how to articulate complex subjects simply. That’s a hard thing to do,” Dziepak said. Dziepak also pursued her first independent research project at Mercer through the Honors Science Research program. Working with Biology faculty member Ron Smith, she spent the summer of 2016 working in two Mercer County parks, examining ash trees for signs of the Emerald Ash Borer, an invasive insect that destroys the tree. “I identified the trees and examined them for health and other issues,” she explained. Dziepak reported her findings in a presentation to her classmates and professors that fall. It was the first scientific presentation she had ever done and laid the groundwork for many that came after. One of Dziepak’s most exciting and validating science experiences came last summer when she participated in Rutgers University’s highly selective Research in Science and Engineering (RISE) program. (Dziepak was funded by the INSPIRE program, which pairs undergrads with post-doctoral mentors.) The intensive ten-week program draws students from across the nation and internationally to work alongside graduate students in Rutgers’ science labs. She is grateful to Dr. Blinderman and Dr. Smith for writing letters of recommendation on her behalf. “You are paired with a Rutgers scientist who best matches your interests,” she explained. Her research focused on toxicology, specifically on the effects of pesticides on the neurology of zebra fish. “We completed two successful rounds of testing, including measuring a higher immune response in the test group,” she said. Dziepak's mentor has already asked her to come back next summer between her junior and senior years. 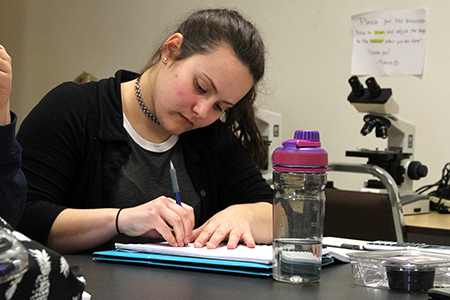 Savannah Dziepak returns to the MCCC Science Learning Center during her winter break from William Paterson. Dziepak was a tutor in the MCCC Science Learning Center during her sophomore year. She continues as a science tutor at William Paterson.